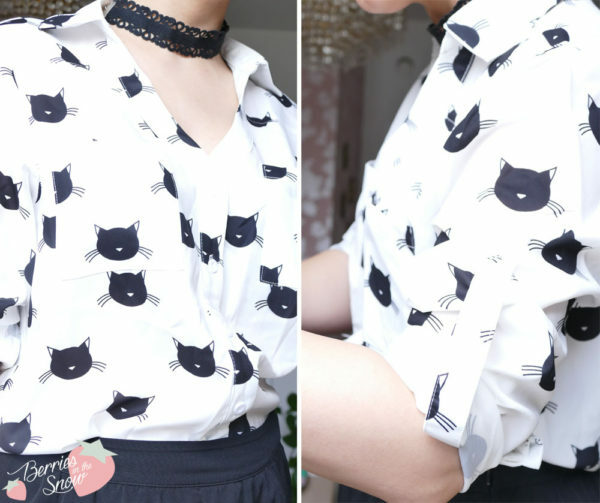 I have a weakness for cat prints and cat themed fashion products and recently I spotted a Lapel Blouse with Cat Print on SheIn matching exactly my taste. Cute prints on a blouse make it look much more girly and soft, although blouses are usually elegant and grown-up. 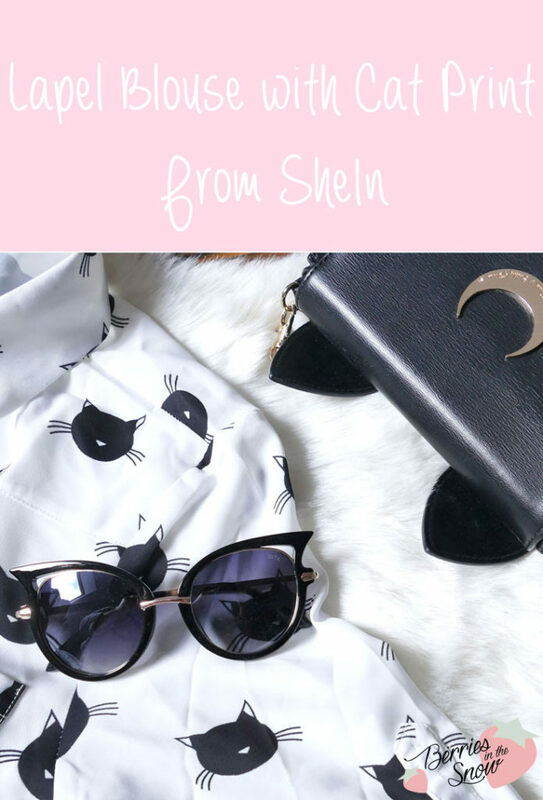 SheIn, formerly known as Sheinside, is an online fashion retailer since 2008, providing affordable fashion targeting women. Apart from clothing like dresses, tops and bottoms, you will also find accessories, shoes and jewelry. This white lapel blouse with cat print is made from polyester and has a thin material, suited for spring or fall. The blouse is printed with cat faces all over. The material is soft, but there are some stray threads on the buttons of the sleeve. The other seams are well sewn. The material slightly see-through, typical for most white clothes. 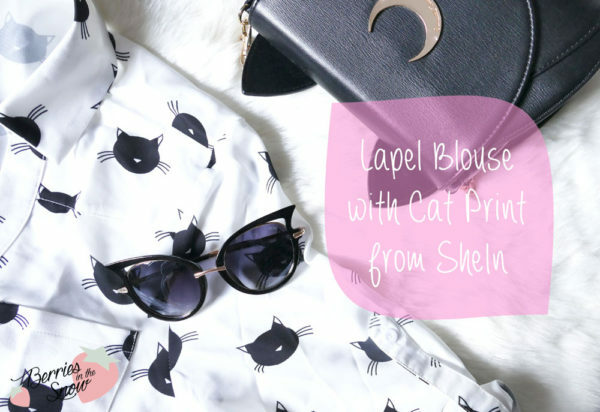 At the moment the Lapel Blouse with Cat Print from SheIn is available in only one size, which is “S”. Luckily, it is a perfect fit for me. It retails for 25.29 US$ at the moment since it is on sale. Get the Lapel Blouse with Cat Print >>here<<! 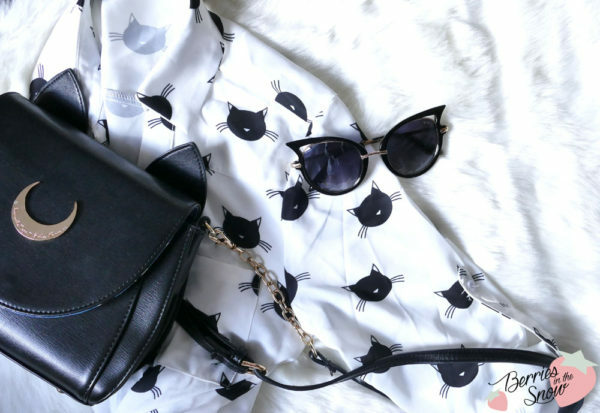 Get the cat eye sunglasses >>here<<. Get the luna bag >>here<<. Just as a short reminder: All products mentioned and reviewed on this blog are of my personal opinions. This product here was sent to me for reviewing purpose by http://www.shein.com which doesn’t influence me in providing my honest opinion on the products. This blouse is so pretty! Love the cute print. I’ve been hesitated for a long time now whether I should buy from SheIn or not. They do have pretty designs but I’m afraid it won’t look the same in real than on photos. What’s your opinion on that, Laven? This blouse is adorable. It depends…for the items I bought I was lucky that they always matched the description, but if I look at some of the ratings of other products there are also products which do not work out as expected (colors etc). I would definitively advice you to read the customer reviews and especially the size considerations.